Touch the button twice: Your reflection is lit up by bright, non-glaring LED light. Fully charged in 3 hours. With adapter cable for micro USB connections, iPhone and iPad. Double mirror with 3x magnification, LED lighting and 3,000mAh battery. 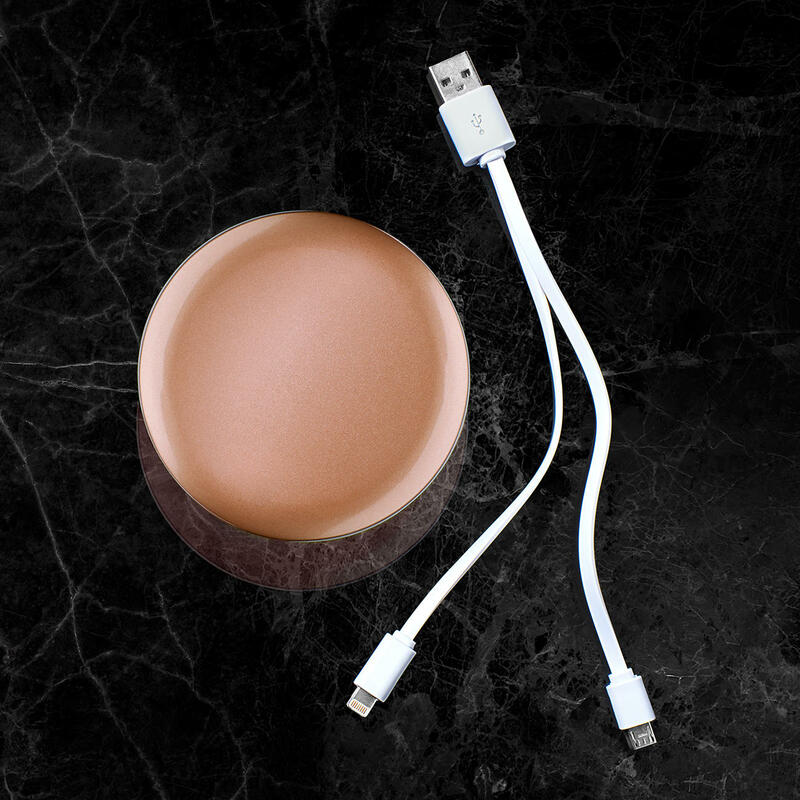 For picture-perfect make-up anytime – and charging current for your smartphone. Hardly bigger than a powder compact, this foldable 3-in-1 mirror easily fits into smaller handbags and suitcases. The 7cm (2.8") diameter mirror surface of the lid allows you to see your entire face and check make-up and hair. The lower mirror with 3-fold magnification is perfect to touch up eyeliner and lip pencil, to pluck the finest hairs, etc. 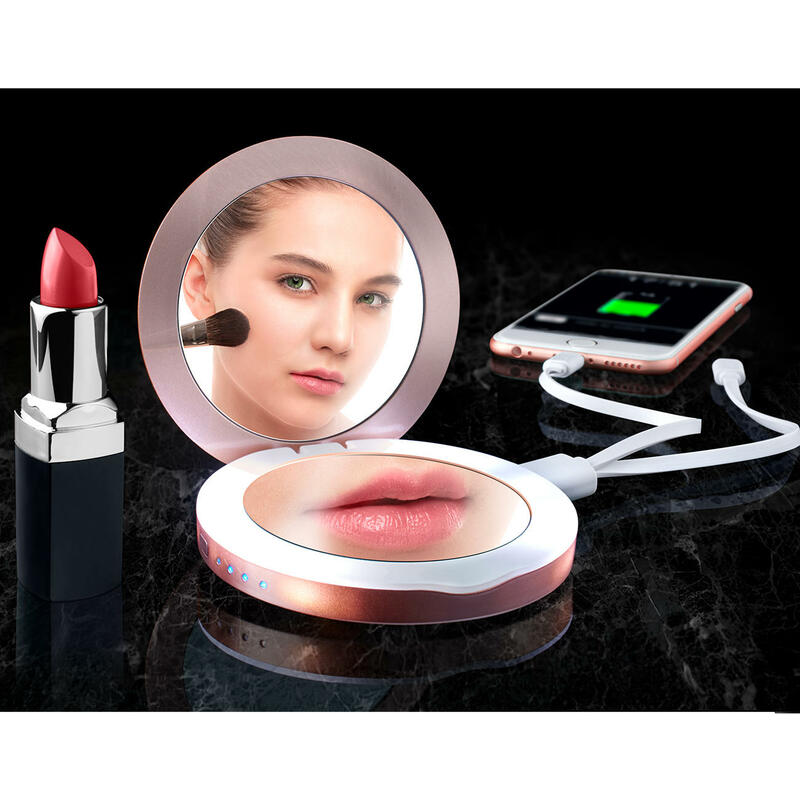 The illuminated frame around the magnifying mirror means you can check and freshen up your make-up in low light conditions, and even in the dark. The integrated 3,000mAh battery feeds the lights and serves to recharge your devices when you’re on the road*. LED charge indicator. Elegant, glossy pink plastic housing with magnetic closure. Folded it measures 9cm (3.5") in diameter, 1.3cm (0.5") in height. Weight approx. 130g (4.6 oz). Delivered with protective velvet pouch. * A Samsung S6 edge with 2.600mAh, for example, will be 80% charged in an hour, and an iPhone 7 with 2,000mAh even up to 100%.